Ask Osama bin Laden and the 22 out of 30 top al Qaeda leaders who've been taken off the field, whether I engage in appeasement. Or whoever is left out there. Ask them about that. As if not being a hindrance to ongoing military operations against terrorists addresses his policies toward nations, such as Iran. 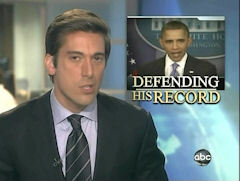 DAVID MUIR: Now to politics and tonight a very pointed response from President Obama as he took questions at the White House today. The President was asked about, among other things, the criticism from Republican candidates when it comes to his handling of foreign policy. And you can almost see him choosing his words as the question is asked. WHITE HOUSE CORRESPONDENT: Republican candidates have taken aim at your approach to foreign policy, particularly the Middle East and Israel and accused you of appeasement. I wanted to get your reaction to that. PRESIDENT OBAMA: Ask Osama bin Laden and the 22 out of 30 top al Qaeda leaders who've been taken off the field, whether I engage in appeasement. Or whoever's left out there. Ask them about that. PRESIDENT OBAMA: Ask Osama bin Laden and the 22 out of 30 top al Qaeda leaders who've been taken off the field whether I engage in appeasement. Or whoever's left out there. Ask them about that. PELLEY: The President also had a sharp answer when he was asked whether Congress will extend the current payroll tax cut which expires December 31st. Norah O'Donnell is at the White House tonight. Norah?